A would-be robber was disarmed by hospitable hosts who offered him a glass of wine and sent him off with a group hug but no cash. A group of friends was finishing a dinner of marinated steaks and jumbo shrimp on the back patio of a Washington home when a hooded man slid through an open gate and pointed a handgun at the head of a 14-year-old girl. "Give me your money, or I'll start shooting," the intruder said, according to Washington police and witnesses. Everyone froze, including the girl's parents. Then one guest spoke up. "We were just finishing dinner," Cristina "Cha Cha" Rowan, 43, told the man. "Why don't you have a glass of wine with us?" The intruder had a sip of their Chateau Malescot St-Exupery and said, "Damn, that's good wine." The girl's father, Michael Rabdau, 51, a federal government worker, told the intruder to take the whole glass, and Rowan offered him the bottle. The robber, with his hood down, took another sip and a bite of Camembert cheese. He put the gun in his sweatpants. Then the story took an even more bizarre twist. "I think I may have come to the wrong house," the intruder said before apologizing. "Can I get a hug?" Rowan, who works at her children's school and lives in Falls Church, Va., stood up and wrapped her arms around would-be robber. The other guests followed. "Can we have a group hug?" the man asked. The five adults complied. 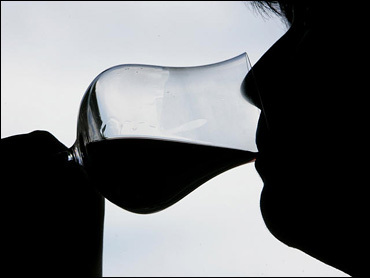 The man walked away a few moments later with a filled crystal wine glass, but nothing was stolen, and no one was hurt. Police were called to the scene and found the empty wine glass unbroken on the ground in an alley behind the house. Police classified the June 16 incident, which lasted all of 10 minutes, as strange but true. The witnesses thought the intruder might have been high on drugs. "We've had robbers that apologize and stuff, but nothing where they sit down and drink wine. It definitely is strange," said Cmdr. Diane Groomes, adding that the hugs were especially unusual.